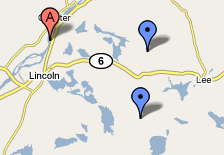 LINCOLN, Maine — Four Lincoln Lakes region towns will be home to New England’s largest wind energy facility and a company headquarters employing five to seven people if a Massachusetts firm realizes its plans, company officials said Monday. With 40 1.5-megawatt windmills creating as much as 60 megawatts of electricity on sites in Burlington, Lee, Lincoln and Winn, the proposed Rollins Wind farm would slightly outproduce the 38-turbine Stetson Mountain site being built between Danforth and Springfield and the 28-turbine wind farm operating in Mars Hill. If all goes well, Evergreen Wind Power LLC, a subsidiary of First Wind of Massachusetts, would begin seeking permits by late summer. Construction would finish in late 2009 at the earliest, said Ryan Chaytors, a senior development associate with First Wind, which was known as UPC Wind until May 1. "We are still in the early stages. We have a lot of study yet to do," Chaytors said after his presentation Monday to the Town Council. "We’re very excited to be in Lincoln. We have had a lot of support from town officials so far." The 40 turbines would cost about $22 million total. They would be built on two sites on the Rollins Mountain range and Rocky Dundee Road areas that run north to south through Lincoln from Burlington to Lee and Winn, company spokesman John LaMontaigne said. Lincoln would have 19 or 20 turbines; Winn, three; Lee, seven; and Burlington, 12. Two turbine sites are listed as alternates. The company also would install a 115,000-vote transmission line that would run from the north end of Rollins Mountain to a Mattawamkeag connection to the New England grid. At the 60-megawatt peak, Rollins Wind would sell enough electricity wholesale to power 23,000 New England homes annually. Given wind’s inconsistency, company officials expect the site would produce considerably less, about 168,000 megawatt hours annually. That’s a conservative estimate. Mars Hill produced 150,000 megawatt-hours in 2007, much more than expected in its first year, Chaytors said. The company, which has had test turbines on Rocky Dundee Road since January, needs to finish testing before it decides whether to proceed, said Matt Kearns, project manager with First Wind. But the test sites have proved successful thus far. Council Chairman Steve Clay and Town Economic Development Assistant Ruth Birtz called First Wind’s interest good news for Lincoln because power from the farm will flow into the New England power grid for sale to power companies. It will not provide electricity directly to homeowners, but the farm would provide a hedge in New England against the runaway electricity costs and brownouts that have been seen in California. It might eventually provide electricity for industrial sites like Lincoln Paper & Tissue LLC. The wind farm will establish Lincoln as a major industrial site for the fledgling — at least in New England — wind power industry. About 300 workers would live in the area during construction, boosting hotels, restaurants and other places workers would frequent and providing work to local subcontractors. The turbines also would provide tax revenues to the communities. "I’m very pleased that we have a major resource, wind, that will be utilized," Birtz said. "We would never have thought of it as a resource."